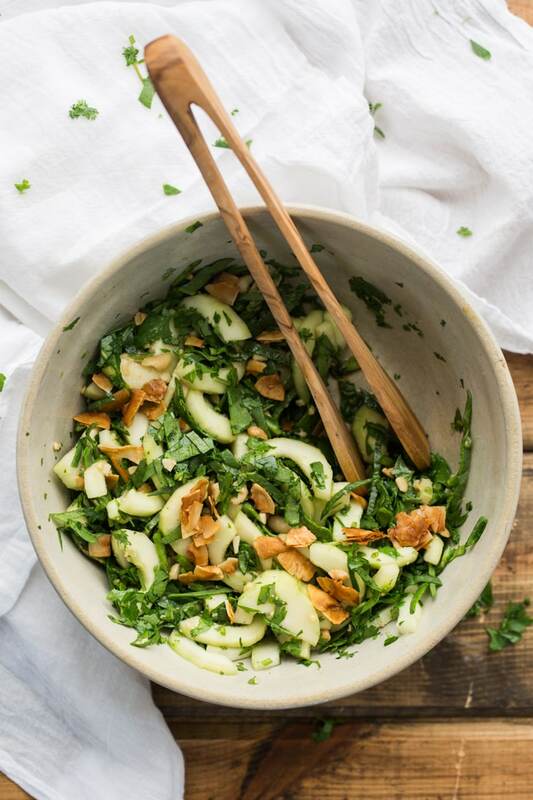 Cucumber Satay Crunch Salad- A Modern Way to Eat | Naturally. Over the past month and a half, I have mastered the art of eating one handed. I joked with M that when I broke my wrist snowboarding last winter, it was in some way preparing me for only having one hand with which to do anything (thanks to having a baby in the other arm). I’ve also found a unique dance of preparing food with either a baby attached (for non-cooking activities) or for prepping as much as I can during a nap time. Because of all of this, you will most likely see an increase in easy, quick meals. This salad has become one of my favorites. 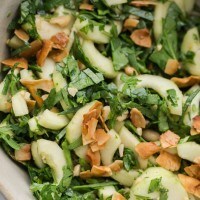 The cool crunch of the cucumber is amazing when paired with a hefty hand of cilantro and a nice extra crunch from peanuts. I’ve actually had a bit of luck growing cucumbers this year (the first time in three years) and so it’s easy for me to pick a cucumber and make this salad. 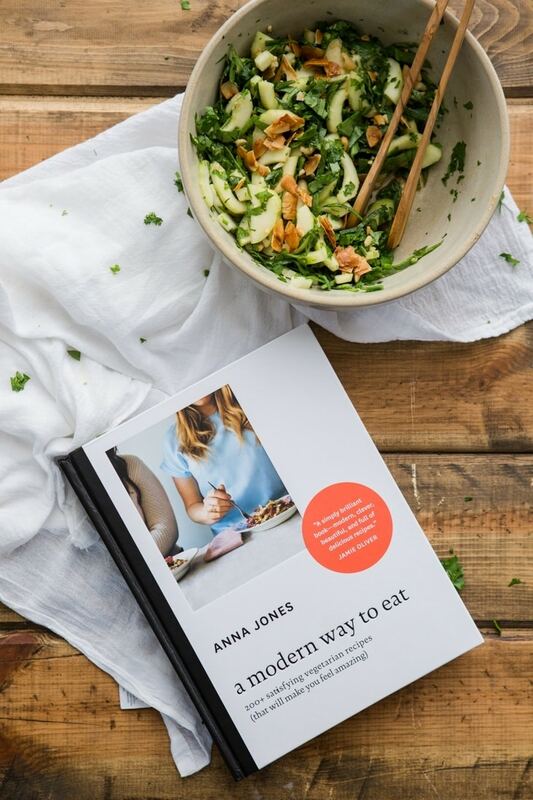 The recipe comes from Anna Jones’ book, A Modern Way to Eat. To say that I’m in love with this book seems like not enough umph behind my words. It’s all vegetarian with over 200 recipes spanning every meal and every season. The book is packed full of inspiration and if you’re only looking to add a couple books to your shelf this summer, I’d highly recommend picking this one up. Peel and half your cucumber lengthwise then scoop out the seeds. Place each side cut-size down and cut into 1/4″ half-moons. Place in a bowl and set aside. In a mortar and pestle, smash peanuts into crumbles (or pulse in a food processor a couple times). Add the peanuts to the cucumbers along with the cilantro and shredded spinach. Juice the lemon into a small jar and add the honey, soy sauce, coconut and ginger. Shake well and pour over the salad. Toss together and serve with toasted coconut flakes. sounds like a delicious combination!!! Crunchy salads are definitely the best! This looks delicious! 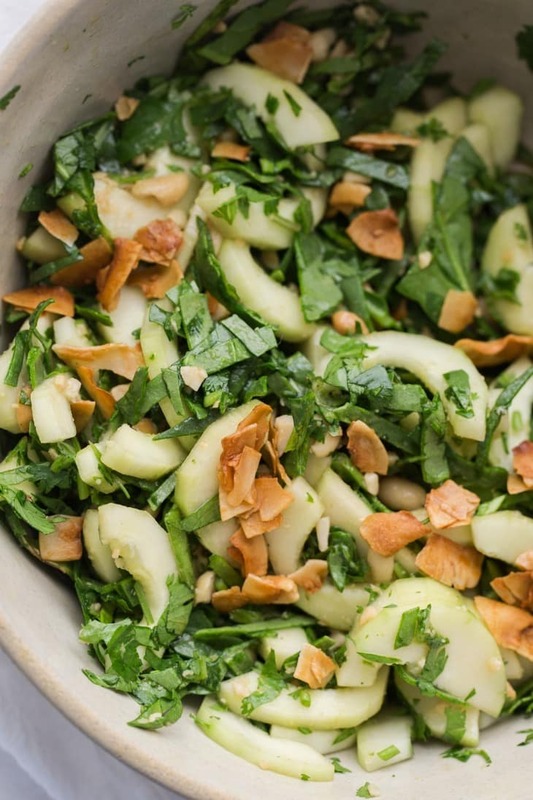 Love the peanut and coconut crunch on this salad, yum! This looks beautiful and has all my favorite flavors… can’t wait to try it! Life saver!!! I was just this minute wondering what to do with all the cilantro and cucumbers my neighbors have been giving me from their overflowing gardens. Thank you! Now I’m hopping back up the page to check out that “naanwich”! The naanwich is one of my all time favorite dinner recipes. I would highly recommend! Another book to add to my collection this salad looks fantastic, a great lunch to take to work. Thank you for sharing I am always on the look out for exciting, tasty and easy to prepare nutritious meals. This looks dreamy. Love myself a crunchy salad! This look delicious. I love putting peanuts in my salads! Congrats on the baby! What a deliciously simple recipe. I always have too many cucumbers so I’m bookmarking this! Great salad Erin. I am digging everything about it, and especially how simply it comes together. Thinking this is the perfect working at home lunch. Thanks for the introduction to a new to me cookbook as well.